APN Outdoor who are proud partners of the Australian Olympic Committee (AOC) are once again bringing the Olympic spirit to Australian streets,. APN Outdoor has teamed up with the AOC to amplify the Winter Games action taking place in PyeongChang and to support the fifty-one athletes selected to represent Australia. 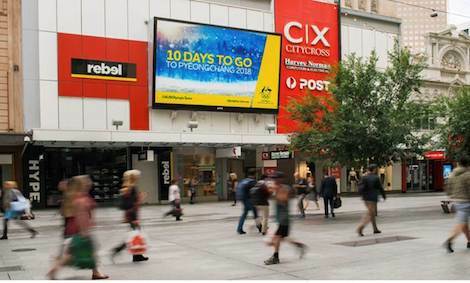 The campaign has been broadcast on APN Outdoor’s premium digital assets in major cities around Australia, encompassing pre games hype, final team announcements, daily countdowns and special messages from the AOC and winter athletes. James Warburton, CEO of APN Outdoor told us “The power of Outdoor, combined with the flexible nature of our Elite Screens, creates the perfect stage to amplify the games and get Australians engaged with these incredible winter sports”. Over the course of the Games, the campaign content will extend to showcase key Olympic moments, medal announcements and individual meet the team creatives. This entry was posted on Tuesday, February 13th, 2018 at 11:45 @531 and is filed under DailyDOOH Update. You can follow any responses to this entry through the RSS 2.0 feed. You can leave a response, or trackback from your own site.